AVX’s 10-9296 Series BTB Pin Jumpers are available in 26mm and 38.15mm pin lengths and are embedded in plastic housings. Units are rated to 9A, 300VAC and are operated in -40°C to +105°C temperature range. Jumpers come with glass-filled Nylon PA-66 insulator and tin-over-nickel-plated brass contacts. Units are designed for board-to-board (BTB) and module-to-module connections in solid-state lighting (SSL) and low-pin-count industrial applications. 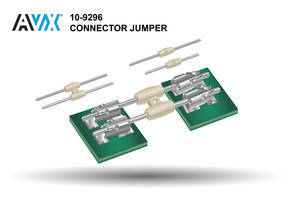 FOUNTAIN INN, S.C., April 11, 2018 (GLOBE NEWSWIRE) -- AVX Corporation, a leading manufacturer and supplier of advanced electronic components and interconnect, sensor, control, and antenna solutions, has released a new series of pin jumpers designed for board-to-board (BTB) and module-to-module connections in solid-state lighting (SSL) and other low-pin-count industrial applications. When used in conjunction with the new 2.5mm 70-9296 Series STRIPT™ horizontal, poke-home contact without a wire stop — which is both the first industrial poke-home connector available without an integral wire stop and, currently, the only industrial poke-home connector with a 2.5mm profile — the new 10-9296 Series BTB pin jumpers are allowed to pass straight through the contacts, completely unrestricted, until the final, user-defined mating dimension is achieved. Unlike traditional BTB pin jumpers — which are made to mate with traditional connectors and are thus closed on the back end, limiting the depth to which a pin can travel and restricting the amount of BTB or module-to-module mating tolerance that the jumper can absorb — the new 10-9296 Series BTB pin jumper/709296001025016 contact combination absorbs the maximum amount of component and assembly tolerances during the mating process, effectively eliminating the PCB and housing tolerance stack-up issues common to traditional connector systems in linear and coplanar applications. SMT Jumpers have low 0.050 in. profile.